Note: If you don&apos;t see these buttons, you likely haven&apos;t approved billing inside your Single admin. This is a blue banner across the top of your Dashboard. For more information, check out our dedicated support article. This is your last chance to edit release information before the metadata (titles, album order, etc.) is encoded into tracks. If Create Standalone Digital is chosen products will be created in your Shopify Admin for Digital Albums & Digital Tracks. 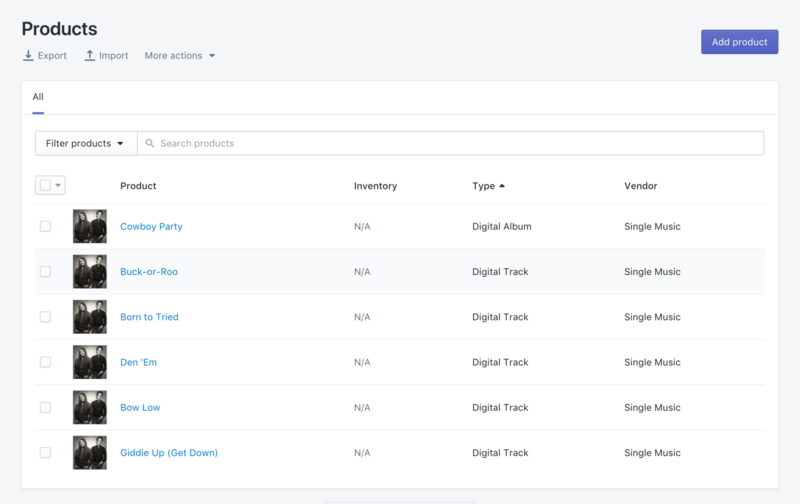 In your Shopify store (and in the example below), you will see products created for each track and a product for the album. Do not delete these individual track products - they are not visible to the public. This is just how we power the tracklist & previews on the album page! Even if your release contains just one track, there will be both a “Digital Track” and “Digital Album” product created. You will see Presale and Scheduled releases in your Shopify Admin - they will not go on sale until the Release or Presale Date! Tracks are assigned the product type Digital Track and are only visible on album pages. When Attach to Existing Product is chosen you’ll be able to bundle or “attach” digital music to products from your Shopify Admin. With this tool you can automatically deliver digital music with the purchase of a physical product. Learn more about bundling in this support article.